For Fall ’09, Missoni is staying true to the label’s knitwear traditions and producing plenty of fabulous pieces including an abundance of hooded scarves. Design one up for yourself and make use of that fabulous knit remnant you have been saving for something special or go big as featured here. This is a patternless design (a simple block draft). You can plot it directly onto your fabric but you will need to straighten the cut ends of your fabric before you are going to cut. The corners should be 90°. The rectangle should be about 60 inches long and 25 inches wide [152 cm x 63.5 cm]. Once that is done, you are ready to cut out the shape. Fold the fabric into quarters both vertically and horizontally and align the raw edges (fig.1). At the “open” corner, measure 12” [30.5 cm] from the corner and mark location with a pin (■). Draw an arc using a circular template (I used a large pie plate) with tailor’s chalk at the corner. Cut through all 4 layers and remove the excess fabric. Open the fabric flat and refold it in the long direction with the right sides facing together. Open the fabric as a “tube” and refold it in the narrow direction with the right sides facing together. Align the sewn seam and match up the open raw edges. Clip the seam allowance at the ■, if necessary. Stitch around the open edge of the loop using a ¼” [6 mm] seam allowance and leave a 6” [15 cm] opening to turn out. 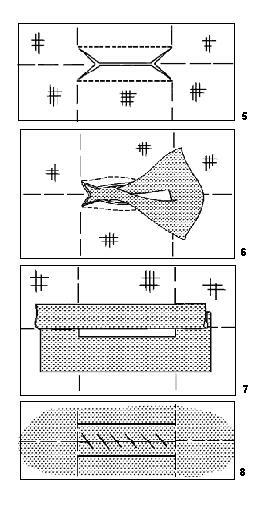 (fig.3) Turn the garment right side out and slip-stitch the opening closed. In many cases, discover your fabric as inspiration and the theme for the piece begins there. There are so many design ideas you can do with patterned fashion fabric and a bit of elastic. Take for instance, the Selma dress with an elasticized bodice and striking rope trim makes for a nautical style and fun back by Christopher Deane. Come across your own themed fabric and try this dress draft for summer. X = bust measurement (measure just under the arms around the fullest part of the chest). Finished length = measure vertically from the armpit to the desired hemline . This is a patternless design (simple block draft). Plot and cut block layout directly onto the fabric according to your measurements as illustrated (seam allowance is included). Cut 1 front, cut 1 back, cut 4 bra cups and cut 4 loop carriers (1-1/2” [4 cm] wide strips). 1. Make 2 self-lined bra cups. Begin by layering 2 pieces, with right sides together. Stitch across narrow top edge using ½” seam allowance. From machine stitching, measure down ½” and sew down both sides of bra piece, using ½” seam allowance. Press seams open; then turn bra cup right side out. Press bra cups flat and topstitch across the top of each bra cup below the openings. Baste the raw edges together. Set aside. 2. With FACE side up, shirr fabric panels using elastic thread in the bobbin. Begin 1” from top edge of panel and stitch across width of each panel. Do parallel rows of shirring about ½” apart (I used the presser foot width as a guide) and continue until you have a shirred length of fabric equal to 1/3 X. For example: if the bust equals 36 inches , you would shirr 12-inch length from the top edge of the panel. 3. With right sides together, layer the fabric panels and align the shirred portions while matching the edges along the length. Pin or baste and stitch to create a tube, using ½” seam allowances. Press seams open. Design Note: The fit of this style is not a snug one. The dress is designed to hang from the shoulder straps. You may get a closer fit by increasing the seam allowance at the side seams. 4. Hem the bottom edge of the tube with a narrow double rolled hem by turning under the bottom edge twice by ½” and press. Topstitch hemline. 5. On one panel front, find the center of the panel above the shirring and mark. Pin/baste one bra cup on either side of this mark, with right side facing. Sew across bottom edges of bra cups. 6. Make carriers 1/2″ X 3″ [12mm X 75mm]; you will need 4 of them. At the outer edges of the bra cups, fold a carrier in half to form a loop and secure to either side of the garment. Divide the back portion between the two loop carriers into thirds. Place a loop carrier at each location and secure. 7. Serge or pink the raw edge of the top edge. Turn top edge to inside and press. Topstitch in place. 8. Cut 2 lengths of cording. Thread cord in each bra casing and gather up excess fabric to create the gathers. Knot cording together to create halter straps and thread through loop carriers. Stay “kewl” this summer with this gossamer sun serape. It is a cinch to whip up in an afternoon. Take your styling cues from Danish design house, Best Behavior and layer it over your tiny tees and baggy pants. This is a patternless design (a simple block draft). You can plot it directly onto your fabric but you will need to straighten the cut ends of your fabric before you are going to cut. The corners should be 90°. Once that is done, trim away the selvedges. Cut a rectangle 72” X 45” [183 cm X 114 cm]. Find the center of the cloth by folding it in half, both lengthwise and widthwise. Mark the location with a pin. Radiating from the center, lightly chalk an arc 5″ [12.5 cm] away from one fold to the other. Carefully cut on chalked line through all layers to create the neck opening. Reserve cut away portion. Fold the width of the bias tape in half and align the raw edges of the tape along the FACE side of the neck opening. Stitch around the neck opening using a ¼” [6mm] seam allowance. Grade the seam allowance. Turn bias binding to inside of opening and press seam flat. Topstitch around neck opening. Open the fabric flat, FACE side down and machine a narrow double rolled hem along all sides. To make the pocket, re-fold the cut away portion from the neck into quarters, with right sides together. Reduce the radius of the arc by 1″ [25mm]. Open the fabric flat and fold in half , with RST. Stitch around the curved edge, using a ½” [12mm] seam allowance, leaving a small opening to turn-out. Trim the seam allowance close to the stitching. Turn pocket right side out and slipstitch opening closed. Press pocket flat. Align pocket to left side of centerfront and edge-stitch pocket to front of garment. Fold garment in half and align corners. Measure up from matching corners on each side approximately 14”[35.5cm] . Tack front and back together at this point (●). Oscar de la Renta shows us how to relax with this 2009 caftan style. The sheer striped silk print is so feminine and the flat braid trim makes this style ultra luxe. Can you just imagine lounging around in this? (You’ll definitely want to sew one up as no pattern is required.) This is a classic piece that belongs in any collection of beautiful, fine clothing. Measure from the nape of your neck down to the desired length: purchase twice this amount of 45″ [114cm] wide fashion fabric and four and a half times this amount of 2″ [50mm] wide flat braid trim . Cut the fabric into two equal lengths. Reduce the width of both pieces to 35″ [89cm]. From the excess cut-away material, cut two rectangles, each measuring 10″ wide x 40″ long [25.5cm x 102cm]. Set these aside to be used for the sleeves. Measure down 4″ [10cm] and mark with a pin. Along the top edge, place a pin 4″ [10 cm] from the foldline. Arc a curve using a compass from the top of the foldline between the 2 pins. Cut out the neck opening. Refer to diagram A. Cut along the foldine of the front piece in two halves (centerfront seam). Measure down 1 ½” [4 cm] and mark with a pin. Along the top edge, place a pin 4″ [10cm] from the foldline. From this pin, measure down 1 ½” [4cm]. Shape the back neck and cut out the neck opening. Refer to diagram B. On the two front portions of the caftan, turn ½” [12.5mm] seam allowance along the centerfront edges and press flat. Open the folded edge. Align the edge of the flat braid to the foldline of the seam allowance. The trim should be on top of the seam allowance with wrong sides together. Edge-stitch the braid to the centerfront edge. Repeat (as mirrored image) to the opposite front piece of the caftan. Layer both front pieces with right sides together and matching the braid trim. Align the trim at the center front. Measure down from the neck edge 8″ [20cm] and mark with a pin. This will create a keyhole neckline. 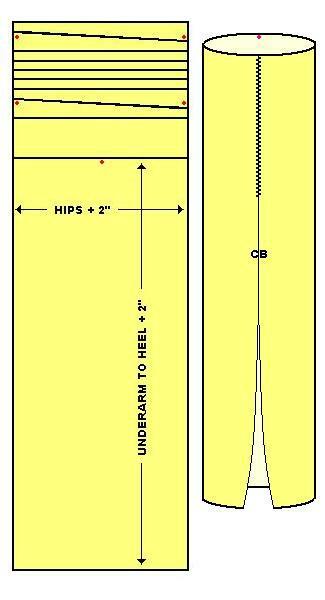 Measure up from the hem edge 18″ [46cm] and mark with a pin. This will create a center slit. With the front piece FACE UP, gently press the centerfront seam open by placing the braid trim flat. On the open edge of the trim, edgestitch the braid to the caftan fronts. With wrong sides together, pin/baste back piece to front piece at shoulders. Sew shoulder seams. Press seams open. Take the two sleeve rectangles and pin braid trim to one long edge in the same manner that was used for the centerfront edge , aligning trim with seam allowance. (There will be some excess at the top and bottom). Edge-stitch braid to fabric to create the wrists. With right sides together, fold each rectangle in half width-wise and mark midpoint location with a pin. With right sides together, pin/baste each sleeve rectangle to the body, matching the pin to the shoulder seam. Sew sleeves to body. Measure the neck opening of the caftan (do not include seam allowance). Cut a length of braid trim equal to this measurement plus 1 inch [25mm]. Turn short ends of trim under ½” [12.5mm] and press flat. Fold trim in half lengthwise. Bind the raw neckline with the trim. Pin/baste in place. Topstitch along edge of braid from CF to CF. Place the front of the caftan together with the back, right sides together. Pin/baste the side seams and underarm seams together. Trim any excess of the trim, if necessary. Stitch the sides. Press seams open. Hem the bottom by binding hemline with braid trim in the same manner used for the neckline. Sew a thread loop and button at the neckline at the centerfront. Sew a button at the base of the keyhole opening and another at the top of the center slit. Evenly space the rest of the buttons along the centerfront seam and sew in place. Lustrous satin fashion fabric shapes an elegant wrap designed with a pull-through slit opening for easy adjustability, like this one by Maggy London. Make stole pattern approx. 16″ X 80″. Round the ends with a circular template (I used a large pie plate). Position slit opening 4″ from one end. TIP: To insure perfect results, make a trial buttonhole slit on the same number of fabric layers as your garment for practice. 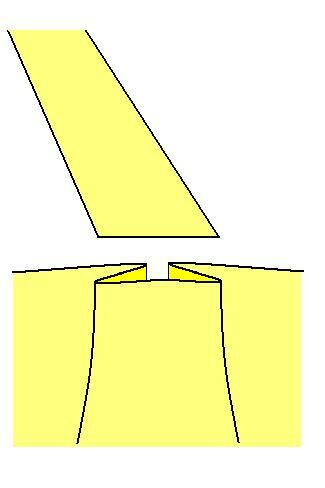 Step 1: Mark slit position and length on WRONG (interfaced) side of one of the stole portions. Thread-trace a 4-inch slit, extending the thread tracing beyond end markings. 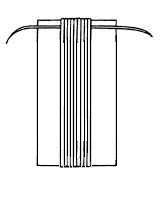 The thread-traced markings should resemble a ladder. Step 2: Cut a self fabric patch for the slit on straight grain, 2″ (5cm) wide and 5″ (13cm). Make a center line horizontally across the length of the patch. With RIGHT sides together, baste the center of the patch along ladder rungs with ends extending 1/2″ (1.3cm) beyond ladder sides. Step 3: On WRONG side, mark lines 1/8″ (3mm) above and below buttonhole marking, using tailor’s chalk. Step 4: Using a small machine-stitch, start sewing along one long side of the buttonhole, following pencil lines, being careful to end stitching exactly at thread-traced ends. Do not stitch across ends, back-stitch or pivot at corners. Bring thread ends to WRONG side and tie in a knot. Step 6: Pull patch through opening to WRONG side of front. This opening should form a perfect rectangle. Roll edges of opening between your fingers until each seam is at the edge of the opening. Press so that none of the patch shows on the OUTSIDE. Step 7: To form “buttonhole” lips, fold each long side of the patch over the opening, so that the folds meet exactly at the center. Step 8: On OUTSIDE, baste “buttonhole” lips together along fold lines and press in place. Basting should remain in place until stole is completed. Step 9: To secure “buttonhole” lips and keep them from shifting, with front RIGHT side up, fold it back out of the way until you can sew the end of the patch and the triangle (formed by clipping corners in step 5) together. Using small machine stitches, stitch across the base of the triangle, catching patch. Trim end to 1/4″ (6mm). Repeat on other end. Step 10: Stitch horizontal seam allowance of buttonhole and patch together, just inside the original stitching. Trim patch to 1/4″ (6mm). Repeat on other seam. Set aside. Step 11: On second stole portion, repeat step 1. Step 12: Cut a self fabric patch for the slit on bias grain, 5″ (13cm) wide and 5″ (13cm). Make a center line diagonally across the patch. With RIGHT sides together, baste the center of the patch along ladder rungs with ends extending beyond ladder sides. Step 13: On WRONG side, mark lines 1/8″ (3mm) above and below buttonhole marking, using tailor’s chalk. Step 14: Using a small machine-stitch, start sewing along one long side of the buttonhole, following chalk lines, being careful to end stitching exactly at thread-traced ends. Pivot at corners and complete the “rectangular” shape of the back opening. Step 15: Snip between the two stitching lines and clip diagonally to corners, as shown in step 5. Be careful not to clip through machine stitching. Step 16: Pull patch through opening to WRONG side of front. This opening should form a perfect rectangle. Roll edges of opening between your fingers until each seam is at the edge of the opening. Press so that none of the patch shows on the OUTSIDE. Step 17: After the stole perimeter is completed, align the opening with the bound “buttonhole” slit and slipstitch rectangle opening to back of “buttonhole” lips. Step18: With RIGHT sides together, layer the 2 stole pieces and align the slit openings. Pin/baste the outer edges. Stitch around the perimeter, leaving 5″ opening along one long edge. 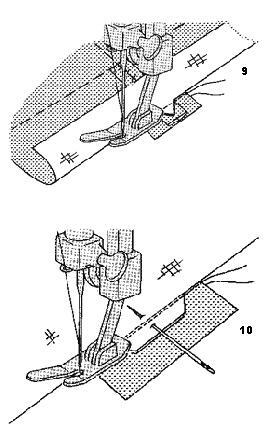 Grade and trim seam allowances. Step 19: Turn stole right side out. Slip stitch opening closed. Step 20: Match and align bound “buttonhole” slit. Complete step 17. Effortlessness and the flow of luxurious fabrics were cited as the most important elements of this autumn/winter 2008-9 shows. The theme continuing on the shoulders and defining the silhouette at the hips, while the simple eveningwear dresses were long, figure-hugging and draped sensually over the body. Simple textures and technically brilliant structures, like the gown by Oscar de la Renta, make this a simple and yes, “patternless” couture project. Finished Length – Measure from under arm to floor. Gown Width – Measure the fullest part of your body – eg. bustline or hipline. Cut 4 strips of fabric 2 inches wide. Cut 4 strips of fabric 3 inches wide tapering to 2 inches wide. Cut 1 rectangle of fabric 8 inches wide by circumference of tube once pleated. Cut 1 rectangle of fabric equal to the finished length plus 2 inches by the gown width plus 3 inches. Set the fabric strips in pairs. For each pair, interface 1 strip following the manufacturer’s direction for fusing. With right sides together (RST), pin/baste the long edges of each pair together. Stitch. Turn right side out and press flat. Edge-stitch along the finished seams. Set aside. Fold the large rectangle in half lengthwise with RST. From the top, leave 18 ½” open for the zipper. From the bottom, leave 19″ open for a slit. Pin/baste the remain edges together and stitch using ½” seam allowance. Press the entire seam open. Align the zipper along the top opening and insert using the center slot method. For the open slit, fold under ¼” of the seam allowance and topstitch or slipstitch the slit opening. Remove gown and measure the finished circumference of the gown, beginning and ending at the zipper. Add 1″ for seam allowance. Record this measurement. Match the 2 tapered straps to the 2 pleats on the front of the gown (red dots) and align the raw edges. Pin/baste in position. Next, pin/baste the narrow straps 2″ away from the tapered straps. Align the raw edges and pin/baste in position. Try on gown. Drape straps over the shoulder and pin/baste other end of each strap to back of gown. Adjust the lengths of the straps and cut off excess. At top of shoulder, fell or tack the tapered strap to the narrow strap with handstitching so they are side-by-side. For the facing, use the smaller rectangle and adjust the width to equally the finished circumference dimension of the top of the gown plus 1″ for seam allowance. On the bottom of the rectangle, turn under ¼”, then turn under 5/8″. Press turning. Fold the short ends of the rectangle to its center. Mark the 2 foldlines with chalk. Open the rectangle flat, wrong side up. Pin the ends of the elastic to where the foldline marks are located. Stitch across the ends of the elastic. Stitch the 5/8 turning along the bottom to encase the elastic. (Stretch elastic as you sew). With RST, match up the raw edges of the facing piece (the side without the elastic casing) and the top of the gown, sandwiching the strap ends between the layers and allowing ½” seam allowance extended beyond the zipper for the facing piece. Pin/baste the top edge of the gown and machine-stitch. Grade seam and press seam allowance towards facing. Under-stitch facing inside of the finished seam. Turn under seam allowance on facing piece at centerback and slipstitch to back of zipper tape. Hand-sew hook and eye set above zipper opening to facing. At hemline, make a ½” double rolled hem. Knotted fringe is actually quite easy to make and can be a lovely addition to any number of fashion design ideas such as on a vest, a skirt hem, or even, curtains. The first thing you must decide is whether your design project requires the addition of fringe or whether the fringe can be knotted from existing strands. You can apply the fringe trim similar to the macramé knotted fringe on this luxurious alpaca and silk shawl from the Viva Terra collection. 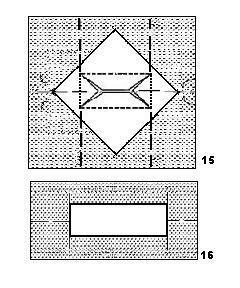 The second option, that of loosing weft (horizontal) threads leaving the remaining warp (veritcal) threads hanging. Measure out how long you want the fringe to be and mark that measurement with a line of stay-stitching. Then draw out the threads up to that stitching line. Decide how many threads you want to bundle together to tie in a knot. Then tie the knots and you will have a lovely fringed trim. 5/8 yd of double-sided fashion fabric, 60″ wide such as woolens, cashmere, alpaca, etc. Yarn for fringing such as embroidery cotton, crochet pearl cotton, silk ribbon, chainette, etc. Cut a rectangle 60″ X 21″ from the fashion fabric. Cut a piece of cardboard about 8″ wide and half as long as desired length for finished strands (add extra length to account for take-up of knotting for thicker yarns). Wind yarn loosely around cardboard, cut across one end when card is filled. Repeat several times and then start fringing; you can wind more strands as you need them. Finish the edges of the rectangle with a narrow hem around its perimeter. Hand-stitch a blanket stitch to the two narrow ends of the rectangle using yarn and darning needle. Use this stitching as the anchor to apply the fringe. Follow these instructions from the Craft Yarn Council of America for knotted fringe to create a diamond pattern of knotting. For single knot fringe, hold the number of strands specified for 1 knot of fringe together and fold in half.